As a school, we promote and celebrate high levels of attendance as a key priority. Our school target for attendance this year is 97% which would be an improvement on last year’s 96.4%. You will already be aware that we issue reward certificates for any child whose attendance is 100% for each half-term. Whilst we appreciate some absences cannot be avoided, we know you will support us in promoting positive attendance levels for all our children. We are, therefore, introducing a further way to recognise and celebrate great attendance. 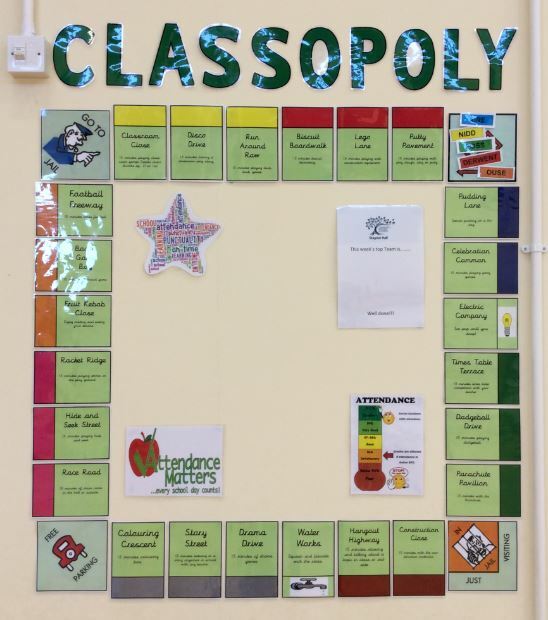 In our whole school assemblies on a Monday, any Team whose collective attendance is higher than 97% for the previous week will get to roll the dice on our new ‘Classopoly’ game. The reward, which our children have chosen, will depend on the square they land on, but could include decorating biscuits, playing with the parachute, extra playtimes and many other examples. We will announce each week via Twitter who our Top team have been and which teams have earned rewards on our Classopoly game. We look forward to celebrating with the children each week and we are sure they will enjoy their rewards!